This is a classic custom country style farm table in recycled chestnut salvaged from old barns and mill buildings. Lately, there have been many websites featuring reclaimed lumber from many sources. A lisiting of those sites can be found in my 'links' category. Other salvaged wood such as Douglas fir, oak, redwood and pine are sometimes available. 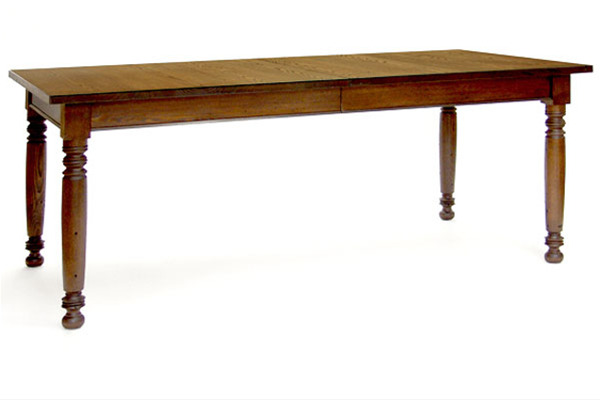 This table expands from 36 x 78 to 36 x 126. Other non- expanding tables with similar styling can be custom ordered. This one hooks onto the carved mahogany table #211, making a table about 23' long. Fixed size, in recycled chestnut or oak, (+/- 40 x 80), about $3850. Expanding rectangle with leaves, $5000. -$6000. Other custom options available.